With me its always been about the music! I Guess I get it honest. I was born and raised in St. Louis county, Missouri. My parents were divorced when I was just a baby. My Mother married a man who pretty much raised me as his own. Both had giant musical influences on me as did my older siblings. In the early sixties I was just one of many lucky St. Louisians that was exposed to the Rock & Roll revolution that was provided by a cutting edge dj by the name of Johnny rabbit on KXOK radio. Soon listening to the radio and buying 45 records became a pastime that would not soon subside. By the time I was six years old I was enrolled in guitar lessons and the pround owner of a Norma 6 string Electric guitar and conrad amp. In the first grade I was already jamming with fellow classmates and co-writing original songs. By now BEATLE mania was in full swing and yes, I was a full fledged BEATLE MANIAC! Buy the third grade i was pretty much done with guitar lessons, I had a grasp of the "major chords" and I felt I could take it from there. By high school, I had already been in several bands and my senior year the current band I was in made a few waves in the high school talent show. As good as we were, we broke up soon after graduation. A quick stint in a wedding band helped me further my vocal skills for what would become my livelyhood for he next eight years. 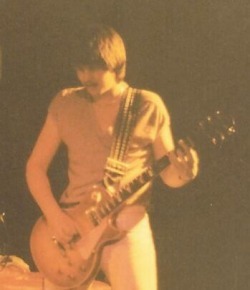 By late 1979 after performing with two local St. Louis bands, I landed a gig playing ryhthm guitar and singing backup for a regional touring top 40 FM cover band called Kidz. 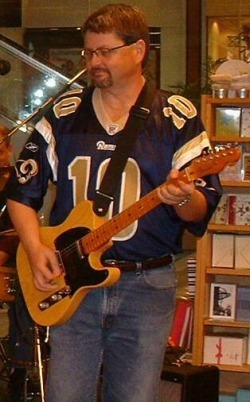 Playing lead guitar for Kidz was a lead guitarist from West Virginia by the name of Mark Moore. 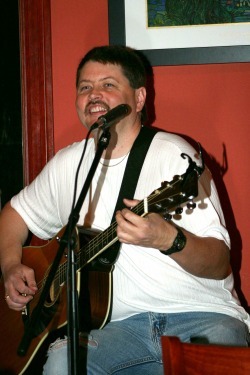 Mark became a life long friend and taught me so much about playing guitar, the music business and music in general. After Kidz Mark went on to become a premier St. Louis Blues guitarsist and I went on to take a short break, well ok about ten years...long enough to get married and have a couple of kidz of my own and start recording ideas of my own that I had written over the years. The flavor of these songs varied a great deal from what I had been performing for so long but I was very un-apologetic. I was very much into the music that I was now creating and its a good thing. I soon found myself performing it for a wide variety of audiences throughout not only the St. Louis area but the whole midwest. To me they have always been the same thing! So after recording my music in little home studio for about ten years, a couple of demos landed in the hands of Nashville session veteran Larry Marrs. Larry being a rock lover himself, but a country performer since hitting the road with such top names in country as T. Graham Brown & Marty Stuart just to name a few, heard my music in a different light....a much different light. After sitting down, talking, jamming and listening to some of Larry's Ideas for my material, it became very apparent to me that it was time to take a new musical road. One that I had never been on before, but one that I had been exposed to many times before. I wasn't afraid to take a new approach to my music, but at my age, I wondered how it would be received? I recorded Coming Home To You and released it to worldwide radio in 2001. It was very well recieved with the title track topping the 1# spot on French country indie charts in June 2003! That same month I was invited to perform at my first Fanfair in Nashville Tenn.....Yep, I was pretty PUMPED!!!! So since 2001 I have been perforning and writing my own original music which up until that point, I had never done before. But as I performed more and more around my home base I found myself longing to do alot of the old standards that I had not done in awhile. As I did more live dates I enjoyed "feeling" out the venue more and more as to what material would suit it best. I guess that everything I have done in my musical past has brought me to this point. So when you are looking for a recording artist Singer/Songwriter to perform at your festival..
give me a call, I can make it happen!